This stylish rocker recliner is great for a tight space. The traditional style recliner can be placed close to a wall , and still reline so that you can relax and enjoy the high plush back cushion, and deep box seat cushion. Rolled arms are attractive, with lovely nail head trim as an accent. This pretty wall recliner is available in over 300 fabrics and 250 high quality leathers by special order, with multiple wood finishes and even nail head trim options. This chair will look great in your home, and blend with your decor. The Chairs That Recline Barcelo Rocker Recliner by Bradington Young at Design Interiors in the Tampa, St. Petersburg, Clearwater, Florida area. Product availability may vary. Contact us for the most current availability on this product. If you love the comfort and functionality of a recliner, but want something that has a little more style and sophistication then look no further. The group of Chairs That Recline offers unique reclining chairs that don't look like typical casual recliners. Blending traditional features and styling with contemporary elements, these reclining chairs take on the silhouettes of accent chairs, club chairs, and wing chairs so that they have a chic appeal while still maintaining the functionality of more traditional recliners. So have the best of both worlds with a comfortable and functional recliner that is still sophisticated, chic, and timeless. 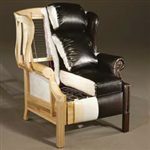 The Chairs That Recline collection is a great option if you are looking for Traditional furniture in the Tampa, St. Petersburg, Clearwater, Florida area. To insure lifetime stability, all Bradington-Young frames are constructed of kiln-dried selected hardwoods that are precision machined. 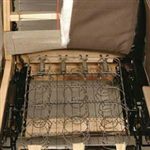 Our "seat pleaser" coil spring seat foundation unit provides the most even and comfortable seating available in motion furniture today. 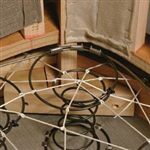 All corners and joints of our products are double doweled, blocked, glued and screwed into position for strength. 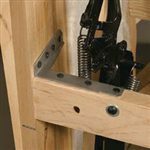 For added durability, we add steel "L" brackets. 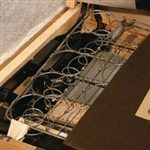 Each mechanism is cycle tested to ensure years of trouble-free comfort and easy, fluid operation. The benchmark of quality stationary is eight-way hand tied construction, unsurpassed in terms of comfort and lasting quality. We use only the most premium, select leathers from resources around the world. 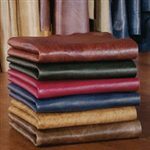 Well over 250 leather selections comprise a breathtaking palette of colors and textures, all supple, natural and top grain. Browse other items in the Chairs That Recline collection from Design Interiors in the Tampa, St. Petersburg, Clearwater, Florida area.